Posted on January 17, 2015 by Lena K.
In my post about my experiences at Comiket, I was asked why exactly games like Touhou and Kantai Collection are so big in Japan. Admittedly, I might not be the best person to ask this question. I mean, I only played one of the Touhou games a few times, and I’ve never played Kantai Collection. Though, I still think I might have some good explanations. With that said, let’s start with Touhou, the older and also more famous game of the two. As I already explained in my post about the game, it’s a bullet hell shooter, fully developed by one man only, with its history dating back to 1996. This isn’t a post about how Touhou became popular or when it actually started to really gain the status that it has right now, because to answer these questions you might have to dig a lot deeper and have an understanding of other factors that I simply have no knowledge in. 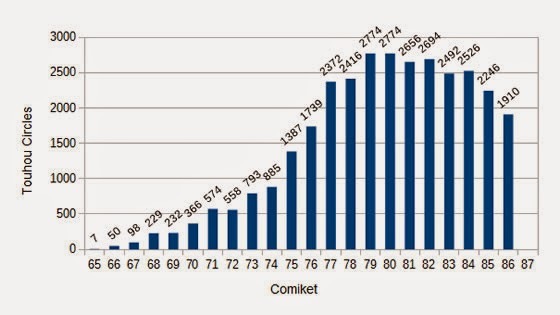 So for now, let’s stick to what the internet tells us and assume that Touhou really “boomed” around Comiket 75 in 2005. I’d say it really “boomed” at C75, though it all started at C65. From that time on you could say Touhou steadily earned more fans, as well as its own day in the world’s largest doujin fair, Comiket. This last statement alone is proof enough that Touhou is big. Like really big. Though, to finally come to the actual question, why is it that big? Is it because of pretty girls in lewd clothing? Looking at some of the character art from a few years ago, I would say it’s a definite no. However, the games’ characters are almost exclusively girls, with only a few, unimportant male characters around. Also, the background stories of many, if not all, of the characters are really interesting, leaving A LOT of room for fans to make up their own stories and settings. It’s also thanks to the fans that characters, like the one in the left picture, turn into something incredible, like what you can see on the right…. And now you have what I described a few lines above: pretty girls in lewd clothing, and I think that is something that many people, not just males, want to see in video games. Another important factor is the variety of the characters. There are already so many of them and each and every year there are more additions. You have a maid, a tsundere, numerous lolis, and so many more different characters that probably every fetishist everyone will be satisfied. However, what I think is one of the greatest reasons for Touhou to be so popular is the background music. It’s not just drawn doujinshi that fans come up with, it’s also music. There are thousands of circles focusing on rearranging Touhou music in any genre you can think of and I can definitely see why they are doing so. I initially found out about this game thanks to its music and not thanks to the great yuri doujinshi. Surprising, isn’t it? Though, let me explain that a little later. So right now, we’ve named 3 reasons: the variety of the characters, their interesting background stories, and the background music. There is only one thing missing in my eyes and that is the game play. I can’t say this for sure, but I think one of the main reasons why people started playing this game is its insane difficulty. I played it on the easiest mode (I think it was still called hard). and I died within just seconds, so yeah…. I just think that the extreme difficulty of this yet kind of simple looking game made a lot of people interested in it, especially in mastering it. So after naming all the reasons why I think it’s so popular, I still think it’s important to mention the following: Touhou is not that big just because of the game that the doujinshi, music, and all the other games are based on. To understand this statement, let me tell you a little story. Some years ago, I was introduced to my now favorite band EastNewSound. I listened to their music for months before realizing that this was not original music, but arrangements based on Touhou’s background music. The same goes for some yuri doujinshi. I read LOADS of Touhou doujinshi before I even found out that that these characters weren’t part of some anime I didn’t know, but rather this Touhou game that I had no idea about. I don’t think I’m the only one who didn’t have a clue about it, and I also think there are still enough people that love Touhou despite having no idea about the game. So is Touhou really that big? I don’t think the game really is. It’s rather what fans make out of it that’s really that popular, but feel free to argue with me on that. So now, let’s also come to Kantai Collection. Don’t worry, I don’t have that much to say about this one. As mentioned above, I haven’t played the game yet, though, I still know how it works, and I’ve seen some people play it, so I at least have a good idea of what this is all about. So unlike Touhou, this game has not been around for too long. I think it’s only been a year. However, its popularity almost immediately rose to really high levels. It already earned its place in the Comiket as the main rival of Touhou, with even higher participant numbers than Touhou, proven during Comiket this winter. For me, the appeal of this game is far easier to understand than when it comes to Touhou. First of all, you can play the game online, and it’s for free. Then, you get really great visuals with many famous artists contributing their art in form of their own characters to the game. And finally, all the characters are voiced too, partly even by really famous seiyuus. Furthermore, and I think this is the most important factor, all the characters are female, and you play as their admiral, trying to “collect” as many ships girls as possible. Well, the name Kantai Collection actually means “fleet collection”, so this makes sense. I guess you could say you can create your own harem with many strong, beautiful, and cute ship-girls, and to be honest, if the game wasn’t completely in Japanese, I would have started playing this a long time ago. Heck, you can even marry the girls in the game. How much more proof could one need?! As a little addition, I also think that the gameplay looks interesting, so I can definitely understand why this game is that hyped. Oh, I almost forgot about this. 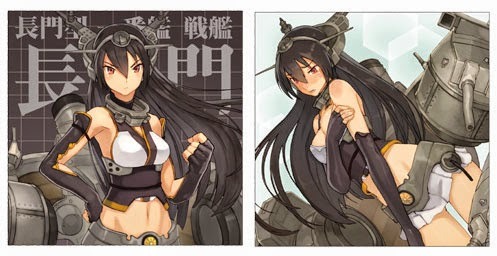 I mean, I mentioned pretty girls in lewd clothing already, but in the case of Kantai Collection, they really mastered the art. So even if you lose a fight, you at least get to see your favorite girls in really little clothing and quite suggestive positions, so way to go KanColle! Still, I might guess that Kantai Collection would have never became so popular and big if Touhou didn’t exist in the first place. You could even say that a huge part of the target group are also Touhou fans who already know how to contribute to a fandom (e.g. many Touhou doujin music circles are currently arranging the Kantai Collection soundtrack as well). Same goes for doujin artists who used to release Touhou works in the past. Many just wanted to go with the flow and try out KanColle . Sometimes it’s even called the “new Touhou “. Finally, and please note that this is only my personal guess: KanColle may surpass Touhou in the future, but keep in mind that the publisher behind KanColle (Kadokawa) is a huge company which aims for a lot of profit (see anime), while Touhou just doesn’t. If you have any more reasons you think I forgot to name or if you disagree with me in some parts or maybe the whole post, feel free to tell me. This entry was posted in Let's Talk About and tagged Kantai Collection, Touhou by Lena K.. Bookmark the permalink. Kancolle seems nice and all— the first 2 episodes are alright — but they'd have to have Nagato x Hibiki for me to abandon my hopes for Meiling x Koakuma in Touhou. You doing those pairs on purpose? Because I don't even see the compatibility of those. I never watched Idolmaster, but I always thought it was…. different… in many ways. Save the seat for when Mutsu dies. 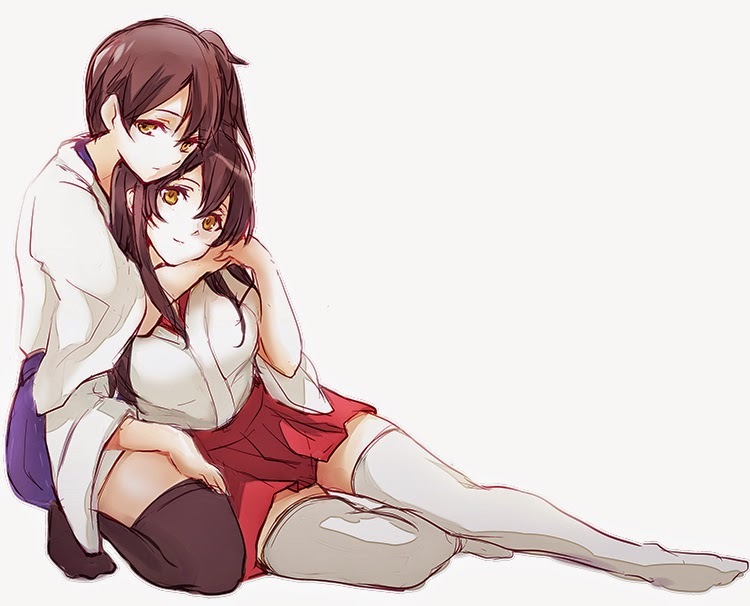 Though, that won't happen, so I will forever and ever ship Mutsu x Nagato. 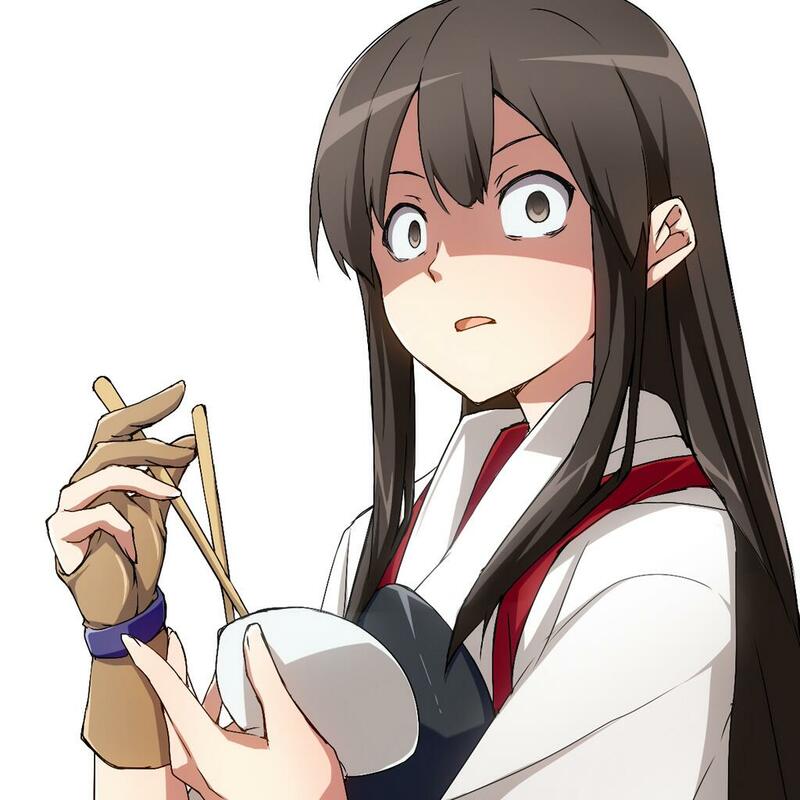 Fortunately you didn't say anything regarding Akagi and Kaga. But if you're even slightly interested, the first episode of “Idolm@ster Cinderella Girls” of 2015 should be fun. Yeah, you should try watching the entire first episode of that. There's a certain yuri-ish end-part of that episode that I keep squealing at. I wouldn't have posted my unrelated stuff if I knew K-on was gonna get bazookered for it. Ah….I do wish (https://www.youtube.com/watch?v=hTPMNxVttfg) was indeed a movie. It has so much potential.